A variety of polymeric composites have been developed to meet a variety of customer requirements for rotors, since no single material will perform satisfactorily in all situations. This brief summary of each polymer's particular features and potential drawbacks is provided to allow the user to make a more informed valve selection. Consult our technical specialists for any additional questions. VICI polymer composites are proprietary formulations: only the generic compound class can be discussed. The specifications in the following discussions are for two position valves. Multiposition selectors generally have lower pressure and temperature limits due to the more complex seal design. Actual specifications for each valve series are shown on the appropriate pages throughout the valve sections of the website. If a valve is to be used at a pressure higher than the given standard, please contact the factory for ordering information. A polyaryletherketone/PTFE composite, the E material receives wide GC use in what had previously been a problematic gap between the optimum temperature ranges of P and T, and in HPLC applications where the temperature requirement is higher than what can be handled by the H material and where a lower pressure limit can be tolerated. (Standard specs are 400 psi at 225°C, but higher pressure ratings are possible at reduced temperatures.) However, this polymer cannot be used in prolonged contact with high concentrations of sulfuric and nitric acids, DMSO, THF, or liquid methylene chloride. A proprietary reinforced TFE composite, Valcon E2 works well at lower pressures and is suitable for temperatures up to 75°C. This material is resistant to most chemicals but should not be used in prolonged contact with high concentrations of sulfuric and nitric acids, DMSO, or liquid methylene chloride. An engineered polyaryletherketone, this high-strength composite resists all common HPLC solvents and dilute acids and bases. However, concentrated or prolonged use of halogenated solvents may cause the polymer to swell. Avoid concentrated sulfuric or nitric acids (over 10%). This composite, a carbon fiber reinforced, PTFE lubricated inert engineering polymer, has long been the standard for typical HPLC applications in which pressures are around 5000 psi and temperatures are not more than 75°C. It is not unusual for these valves to be ordered for use at 7000 psi, and less frequently for use at 10,000 psi. However, at that point the lifetime may be shortened by as much as 50%. Valcon H is the rotor material used in the W and UW series, where no rotor material letter is added (as: C10W or AC6UW). This material, basically a hydrocarbon in structure, is the most impermeable to light gases of all the rotor materials currently available, with wide acceptance in low-temperature (50°C maximum) trace gas applications. Avoid use with aromatic hydrocarbons. This composite, the majority of which is PTFE and carbon, was the standard choice for most GC applications before the development of Valcon E. (Standard specs are 400 psi at 175°C.) Routinely used at 1000 psi, 75°C, it can also be used at temperatures approaching 200°C with decreased sealing tension; however, at that point Valcon E is probably a better choice from a lifetime standpoint. Valcon E can replace P in most applications. While rarely used today, Valcon R (a PTFE composite) still finds use in low temperature/pressure situations which require its nearly universal chemical inertness. Of the chemicals encountered in commercial practice, only molten sodium and fluorine at elevated temperatures and pressures produce any detrimental effects. Its most severe limitation is that it cannot go over 75°C, even at only 400 psi. This polyimide/PTFE/carbon composite has been used successfully for many years and still cannot be surpassed when applications demand operating temperatures between 230° and 350°C. (Valcon E gives better results at temps below 230°C.) However, the seal material sometimes develops a tendency to stick, making the valve difficult to turn. (This usually occurs at lower temperatures.) In extreme cases, the valve doesn't position accurately, and the valve and rotor can be damaged. 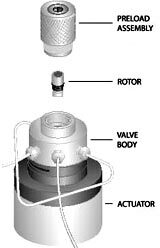 Technical Notes 201 (for two position valves) and 704 (for selectors) contain instructions for reconditioning the material if this condition should arise. Valcon T is susceptible to attack from steam, ammonia, hydrazines (anhydrous liquids or vapor), primary and secondary amines, and solutions having a pH of 10 or more. Chemical reagents which act as powerful oxidizing agents (nitric acid, nitrogen tetroxide, etc.) must also be avoided. Valcon T can be used in "hot" GPC/SEC applications with O-dichlorobenzene as a solvent. This is the series designation for a valve with a virgin PTFE seal. Its mechanical characteristics are poor compared to the other choices, but occasionally its use is dictated by the presence of oxidizing agents too strong even for the R material. This designation indicates a proprietary polyimide blend with chemical properties similar to Valcon T, but with higher compressive strength. The flat Cheminert rotor is engraved with slots to connect the ports in the stator. The tapered Valco rotor is held in place by a preload assembly. The rotor material is shown in black.